CSBG reporting and compliance made easy. 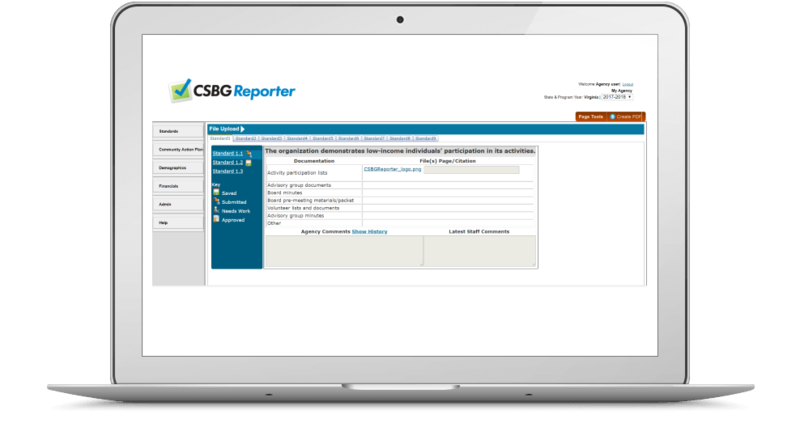 CSBG Reporter™ software gives CSBG State Managers an at-a-glance view of how Community Action Agencies are making an impact in communities across their state. We work closely with State Managers to ensure our online system is designed to be affordable, accessible, and efficient. Software built to help manage CSBG documentation. Our online software makes it easy for agencies to upload, share and review documentation - and is convenient for State Managers to monitor progress towards compliance. We manage all the IT and user support, so both Managers and Agency staff can focus on the people their programs serve. Our “Org Standards” dashboard shows when standards documentation has been submitted, updated, and reviewed, and whether standards are met, or remain unmet. State Managers can also attach Technical Assistance Plans (TAPs), helping agencies go beyond compliance, and share “best practices” with their peers. Allows your agencies to submit their annual plans and documentation, then report on NPI progress throughout the year. Get a birds-eye view of the programs in your state and the people they are serving. Use our system to track budgets, expenses, and budget modifications, as well as create invoices for grant requests and reimbursement. Rein in your paperwork and go beyond compliance!